OWINGS MILLS, Md. 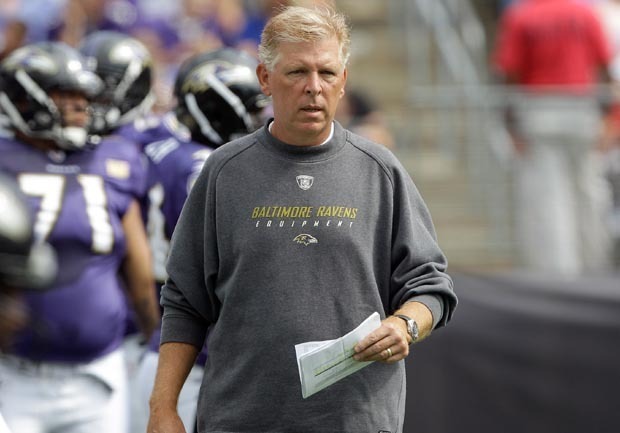 Cam Cameron has been fired as offensive coordinator of the Baltimore Ravens, who have lost two straight and are still striving for consistency in the running and passing game. Cameron ran the team's offense since the start of the 2008 season, when current coach Jim Harbaugh replaced Brian Billick. Since that time, the Ravens' attack has repeatedly taken a back seat to the team's defense. Baltimore (9-4) scored seven points after halftime Sunday in a 31-28 overtime loss to the Washington Redskins. Quarterback Joe Flacco passed for only 182 yards, lost a fumble and was intercepted in the third quarter. "It's a bit stunning that Baltimore's dumping its offensive coordinator with three games left in the season, but it's also a little bit stunning that the Ravens haven't made a move before this point," CBSSports.com's Will Brinson writes. "Cameron's refusal to spread the field and truly utilize Ray Rice has been perplexing to say the least."